Bible Blog › Military Outreach › Come and See! Words like victory, triumph, power, overcoming, and hope are often used to describe the Resurrection. There is another phrase which could be even more important: Come and See. The same words describe the Military BibleStick as Faith Comes By Hearing reaches another exciting milestone of ministry to our servicemen and women. Since the program began in 2008, over 410,000 Military BibleSticks have been provided to our troops! The total continues to climb as chaplains stationed all over the world request more of these rugged, pocket-sized Audio Bibles every day. With the celebration of Christ’s resurrection approaching, we want to continue to offer the invitation to Come and See by providing another 13,000 Military BibleSticks for our troops and their families before Easter. The Resurrection proves that Jesus has the power to transform lives, and His victory is a source of hope, strength, and courage to those who need it. Whether battling the exhaustion of daily toils, struggling with homesickness, combat stress, or even PTSD, the triumph of the empty tomb provides encouragement to overcome and the strength to persevere. While many families look forward to spending time together at Easter, we recognize the sacrifice that many of our troops are making, away from home and family, protecting our nation. The Military BibleStick is a great way to invite our troops to Come and See how much we care by connecting them with the life-changing message of the Gospel. Hearing the Word of God is a powerful reminder for them of His presence and a source of strength and peace as they faithfully serve. The Easter season is a great time to get involved. Every church that gives $1,300 to provide 52 Military BibleSticks will receive a special plaque thanking them for their participation. We are thankful for over 1,400 chaplains and 7,000 churches, including Hosanna Free Lutheran Church (St. James, MN), Brownsville Christian Church (Brownsville, OR), Gospel Light Baptist Church (Mechanicsville, MD), Bethel Congregation Methodist (Pleasant Hill, LA), and Copperfield Church (Houston, TX) for supporting our troops by providing Military BibleSticks. 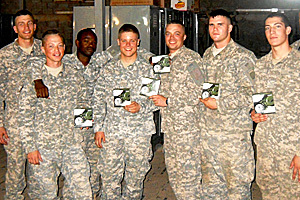 Image: A group of Soldiers, stationed in Iraq at the time, happily displaying their newly received Military BibleSticks.